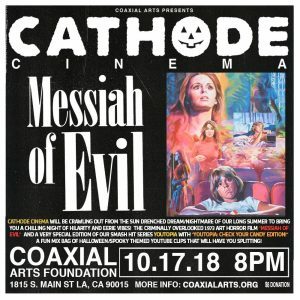 Wednesday October 17th, Cathode Cinema will be crawling out from the sun drenched dream/nightmare of our long summer to bring you a chilling night of hilarity and eerie vibes! The night will kick off with a very special edition of our smash hit series YouTopia with “Youtopia: Check Your Candy Edition!” A fun mix bag of Halloween/Spooky themed YouTube clips that will have you splitting! Prepare for Halloween Safety Films, Bad Commercials & TV Specials, Terrible Costumes, Creepy Fetish Vids, Select Clips From Trash Art Horror Shlock & More! “Theres a certain type of person who likes to walk in LA. The summers prove to be an endurance and to walk just a few blocks by most cities standards, here it is something biblical. Like any Joseph looking for some shade. Hallucination sets in as your eyes burn from the sweat drowning them, the mirage of your life is quick sliver laughing at you. The city bus that never comes, a cold dream. This same person also knows that the nights in Los Angeles is where the real walking takes place. To walk in LA at night is the true after hours life of the city. The streets cloaked in blue light are like endless empty hallways, and others prefer to roam in this way, at this time too. Lots are homeless, some are just wanderers, others unknown. This is where Messiah Of Evil lives. In the after hours of Los Angeles. In this regard the film is very much a companion piece to the equally isolationist and cerebral 1962 film Carnival Of Souls. A woman lost. The world at night she wanders in, a disconnected dream state filled with lurking entities. Although it would be too easy to say for certain if this film operates in the cliche of “Is it a dream?” It certainly proves a more wakeful experience than Carnival Of Souls, which is why it has such an interesting, creepy vibe. Others have perceived the film as social commentary about consumerism, or perhaps even feminism in the way the film is about a woman tangled in a mans world, an after hours world. Even the consumerism and imagery of the Art world is on display for interpretation, our main protagonist is in search of her missing father who runs a well to do Art Gallery and his home is filled with modern Pop Art-type works of ominous monochromatic portraits of vague men in suits. Like the vague men who wander in the after hours of Los Angeles. 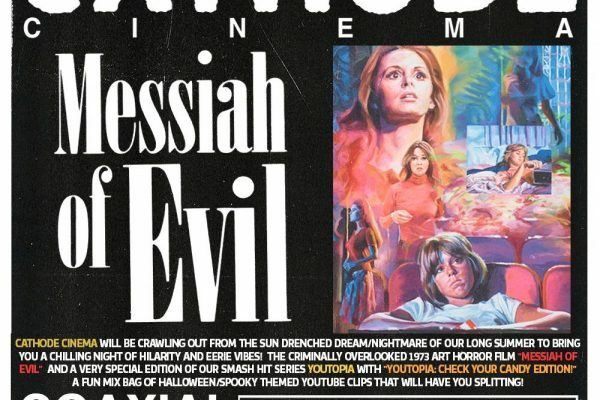 A very overlooked film in the Horror/Cult genre and an even more overlooked film in the canon of great films shot entirely on Los Angeles streets and real locations: A grocery store (in a stand out scene) gas stations and parking lots that look like Ed Ruscha paintings, dark beaches that feel like the vampiric hangouts in a Jean Rollin film, Pop-Art/Neo-Noir set pieces, dingy alleys and Motels all beautifully capturing the lonely aesthetic of this fine city. Los Angeles is a great loner city because it demands it of you. There really isn’t a neighborhood scene here like San Francisco or New York. But theres plenty of landscape to dream in here.